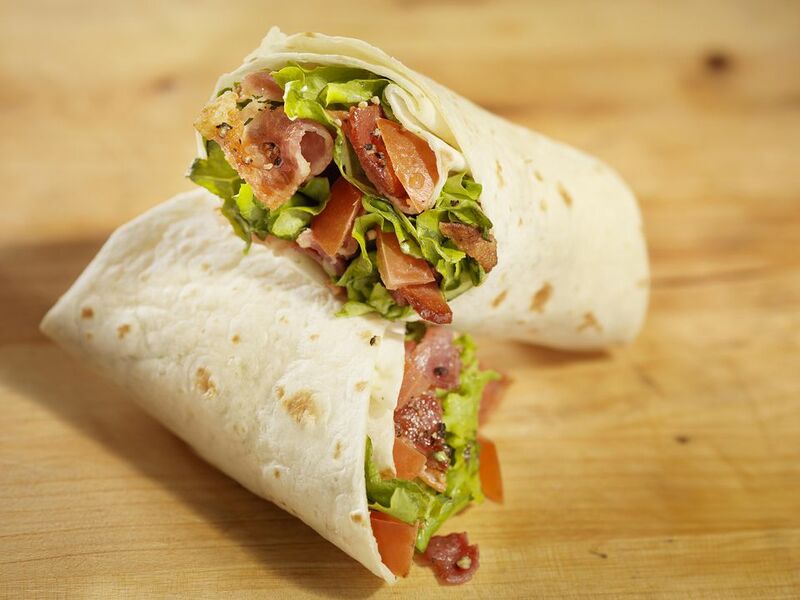 These delicious BLT wrap sandwiches can be made ahead of time and placed in an insulated lunchbox along with ice packs or a frozen juice box or two. It's a wonderful recipe for a lunch box, or it's also great for a quick meal at home. We prefer the type of bacon that is precooked and shelf stable. It just takes a minute or two of heating in the microwave to make the bacon super crisp and perfect. You can, of course, fry bacon in the traditional manner for this recipe, or bake it in the oven for less mess. Keep all of the ingredients for this sandwich wrap on hand and you can make it in a few minutes. Spread some of the softened cream cheese on each flour tortilla and set aside. In a large bowl combine the tomatoes, avocado, green onion, cooked bacon, ranch salad dressing, and mayonnaise and mix well. Place this mixture on the tortillas and top with the salad greens; roll up. Serve immediately or wrap well and chill for 3 to 4 hours, then serve.